Product Overview Project stunning colourful images even in a lights on environment using the H114. Designed for watching TV shows, sports and movies or playing action-packed games on a huge screen. 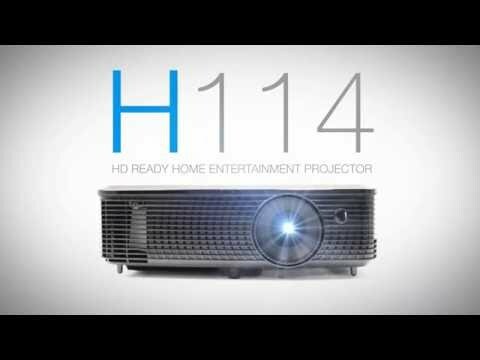 The bright, portable and lightweight H114 is your perfect HD ready home entertainment projector. Easy to setup and use with a built-in speaker and HDMI input. Perfect for connecting a laptop, PC, Blu-ray player, media streamer or games console. You can even take it round to a friend’s house for a sports event, movie night or games marathon with the optional carry bag (sold separately). Watch your movies, TV shows and play games with stunning colours in any environment. Optoma projectors provides you with reliable performance suitable for any content and environment. Our home projectors are capable of reproducing the Rec.709 colour gamut, the international HDTV standard to guarantee accurate reproduction of cinematic colour exactly as the director intended. Or more saturated colours for a punchy looking image, great for gaming and animated movies.. Stream Full 1080p 3D content to your projector wirelessly; eliminating the hassle and extra cost of installing long cables, the WHD200 (sold separately) allows you to connect a Blu-ray™ player, set-top box, gaming console or AV receiver instantly. Features • HD Ready – 3400 ANSI Lumens. • Exceptional colour accuracy - Rec709. • Easy connectivity - HDMI, VGA, 2W speaker.